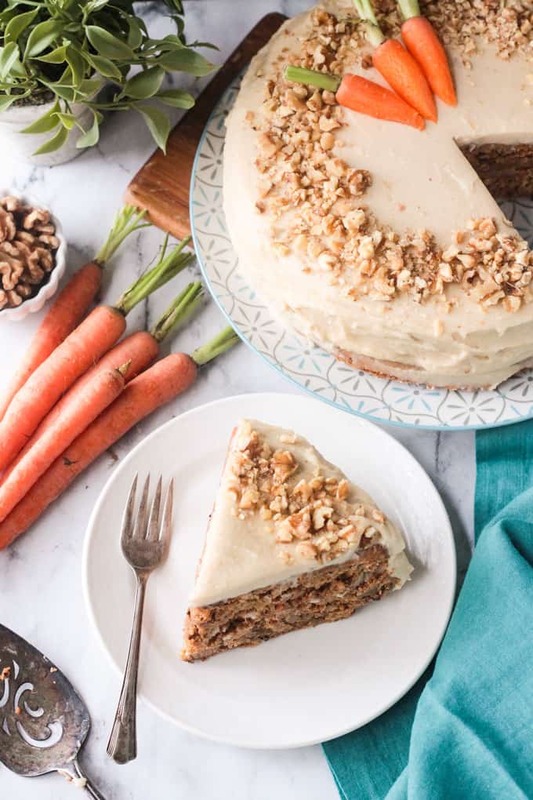 Vegan Carrot Cake – This delicious spice cake is dense, sweet, and super moist, just like a good carrot cake should be. 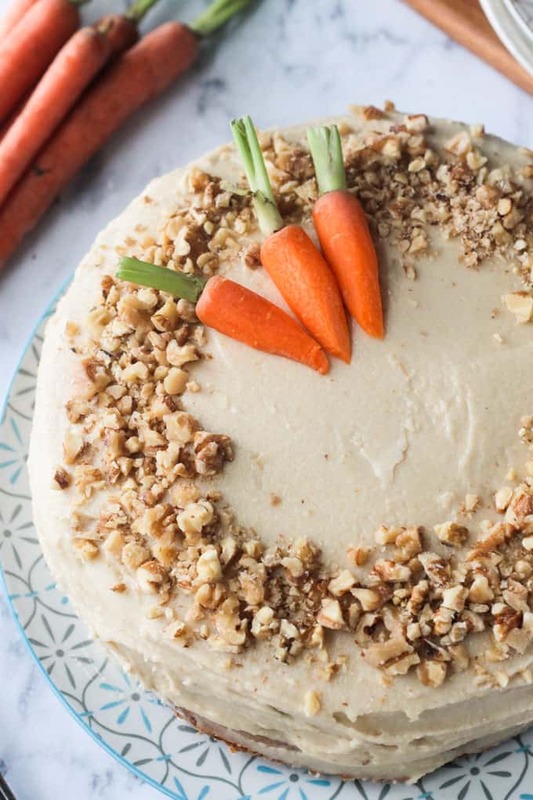 Topped with a dreamy cashew cream cheese frosting, this sneak veggie dessert is perfect for your Easter menu or an anytime decadent treat! I love my sweets, but in all honesty, I’m not a huge cake lover. I find traditional cake to taste too sweet and not much like anything else. I solved this problem with my Chai Spiced Pumpkin Layer Cake…so much flavor! It even earned a Reader’s Choice award in a bake-off! And again with this Vegan Carrot Cake! 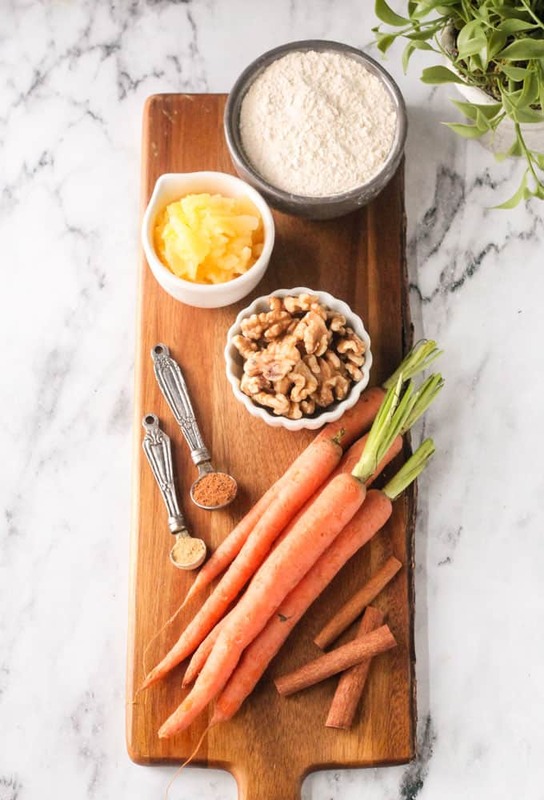 This carrot cake recipe has loads of flavor from the warm spices and a balanced sweetness that comes from fruits and veggies, not just sugar. This Vegan Carrot Cake turned out perfect! Just sweet enough, dense texture, and super moist! There are some staunch carrot cake lovers out there who will tell you exactly what you should not put in your carrot cake recipe…mainly, pineapple, nuts, and/or raisins. I’m not a fan of raisins, so we’re good there. But, the other two, I’ve got them, and I’ll tell you why – moisture and texture. Carrot cake is soft and moist and dense, so the nuts bring a nice contrasting texture. You can sub with pecans if you prefer. If you really don’t like nuts, or are allergic, feel free to leave them out. You’ll still have a darn good carrot cake! The pineapple adds the perfect amount of additional moisture. You could use applesauce instead, but I find it makes most cakes too heavy and doesn’t add as much moisture as the pineapple. What Does Carrot Cake Taste Like? Carrot cake doesn’t actually taste like carrots. However, the carrots lend a subtle sweetness and certainly up the nutrition factor. As noted above, I make my Vegan Carrot Cake with pineapple. But, again, it’s an ingredient you won’t be able to taste. Some carrot cakes with pineapple absolutely do taste of pineapple, and that’s fine if that’s what you’re going for. But, here, we are using the pineapple as moisture, and another layer of sweetness. So, what does carrot cake taste like? It’s tastes like a spice cake. Cinnamon, nutmeg, and ginger mingle with vanilla and caramel-y coconut sugar to provide the most amazing flavor. Bonus: your house will smell amazing as it bakes! But, this is no light and airy cake. It’s dense, yet soft, and incredibly moist. Just like a perfect carrot cake should be! Most people can probably agree that any good carrot cake has cream cheese frosting. I’m not going against the grain on this note. It’s creamy, tangy, and sweet and is, quite literally, the icing on the cake! Since we are dairy-free here at Veggie Inspired, we aren’t using cream cheese, but instead blending cashews with a little lemon juice to create that same creamy tangy texture. Vanilla and powdered sugar sweeten it up. If for some reason, you are against a delicious dreamy cream cheese frosting, or if you are allergic to nuts, you can use my Cinnamon Buttercream Frosting that I use on my Chai Spiced Pumpkin Layer Cake. 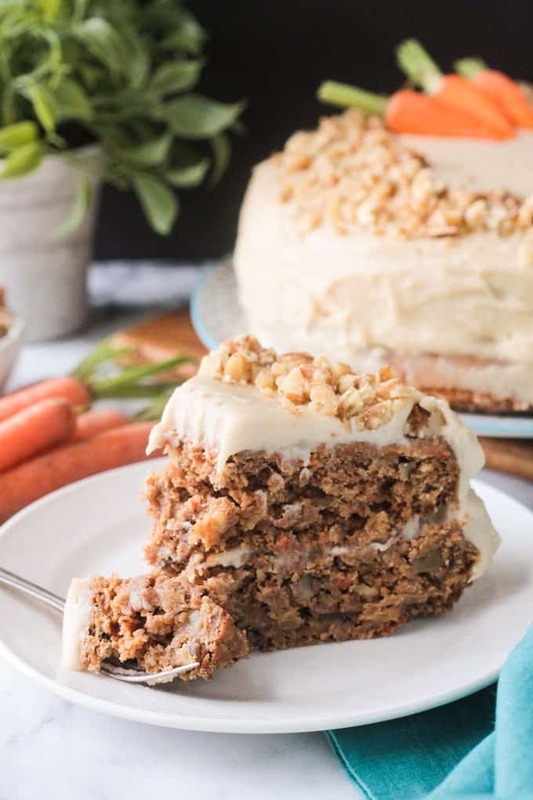 It would be divine with the flavors of this Vegan Carrot Cake. Your favorite store-bought frosting will also work. 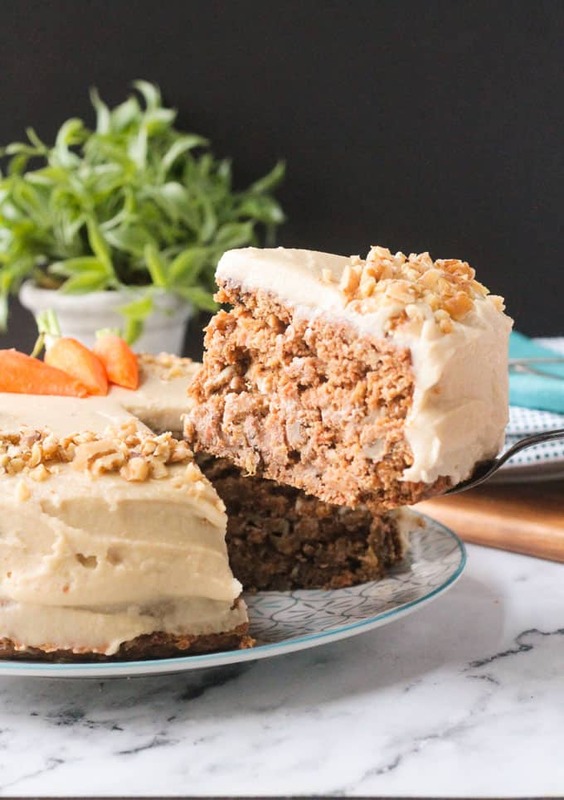 I hope you love this Vegan Carrot Cake Recipe as much as we do. If you make it, please come back and leave me a comment below with your feedback and star rating. This delicious spice cake is dense, sweet, and super moist, just like a good carrot cake should be. 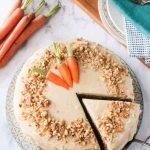 Topped with a dreamy cashew cream cheese frosting, this sneak veggie dessert is perfect for your Easter menu or an anytime decadent treat! Line two 9-inch cake pans with a circle of parchment paper or lightly spray with cooking spray. Set aside. In a medium mixing bowl, whisk together the flour, baking powder, baking soda, cinnamon, nutmeg, ginger, and salt. In a large mixing bowl, whisk together the crushed pineapple, vanilla, vinegar, coconut sugar, maple syrup, coconut oil, and almond milk. Stir the dry ingredients into the wet just until incorporated. Stir in the shredded carrots and chopped walnuts. The batter will be thick, but still pourable. Divide the batter among the two prepared cake pans. Bake for 35-40 minutes or until a toothpick inserted in the center of the cake comes out clean. Let the cakes cool in the pans on a wire cooling rack for at least 10 minutes. Then, turn the cakes out and let them continue to cool on the wire cooling rack. Add the soaked cashews, lemon juice, vanilla, powdered sugar, and salt to a food processor. With the food processor running, slowly pour in the milk through the top spout. Then slowly pour in the melted coconut oil through the top spout. Continue to process until the mixture is perfectly smooth, stopping to scrape down the sides as necessary. Add additional milk 1 tablespoon at a time if needed to get the mixture smooth. Transfer the frosting to an airtight container and place in the fridge for several hours or overnight to let it thicken and set up. Once the cakes have completely cooled and the frosting has thickened, turn the cakes upside down so that the perfectly flat sides are face up. Spread a thin layer of the frosting over the top of one of the cakes. Stack the other cake on top and then gently frost the whole cake. Store any leftovers in an airtight container in the fridge as the frosting won't stay solid if it gets warm. ~You should have just enough frosting for a thin layer between the two cakes and to cover the whole thing. If you like a LOT of frosting, you may want to double the recipe. ~Make sure the cakes are completely cooled before you start to frost. You may need to let the cold frosting sit for just a few minutes at room temperature in order to spread the frosting easier. After frosting, stick the entire cake back in the fridge for 20 minutes to set (or stick it in the freezer for 5-10 minutes). ~Store all leftovers in the fridge in an airtight container. I can only speak to the frosting, but it was HEAVENLY! Used it for a banana cake for Easter dessert. THANK YOU! Yay! That’s amazing! Thank you. And, banana cake sounds so yummy. I have made the carrot pancakes!!!! They were a treat for my husband and I the day after a really long mountain bike ride. They were off the hook A MAZING!!!! Will definitely make them again and try this cake too at some point. Oh, yay!! I’m so excited to hear this, Christine! What a wonderful treat after an awesome ride. I’m jealous that you have mountains nearby…where do you live? 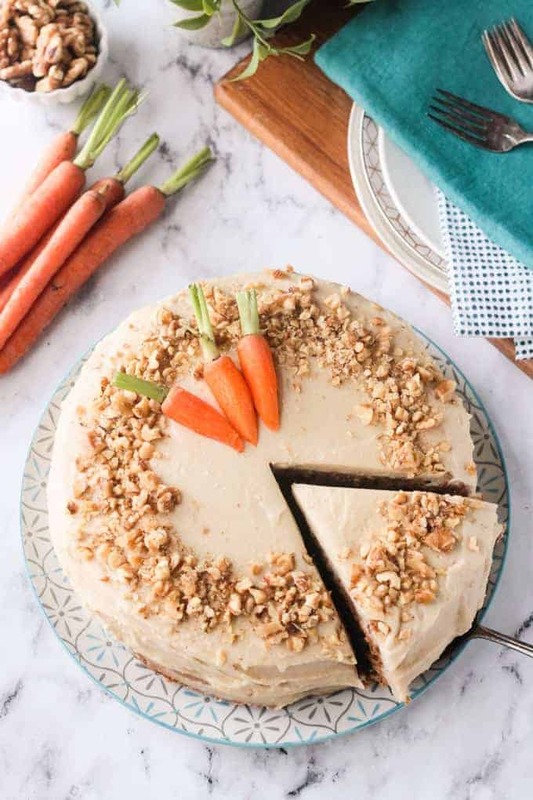 I can’t wait to make this–ever since you posted the recipe for carrot pancakes I’ve been wondering how to convert into cake! There are some almond cream cheeses in the stores–could you make frosting from those instead of making it from scratch? Thanks. Thanks, Maggie! I can’t wait for you to make it either! Yes, you can definitely use store-bought cream cheese as the base. Taste as you go because the flavors won’t be exactly the same. You may need more or less sugar and you may not need as much or any lemon juice. You could blend it with a bit of dairy-free butter, like Earth Balance, if you need it smoother and richer. Let me know how it turns out! This is a great recipe. I made this into cupcakes so I could share with friends. It’s a perfect Easter (bunny) cake. Carrots–get it? I had to make a few substitutions since I didn’t have maple syrup (I used Karo syrup) and I didn’t have enough coconut oil on hand so I topped off with olive oil and no walnuts but I did have pecans. I also used gluten free flour so this was a gf vegan cake. Really like the pineapple addition ( I assume this acts like applesauce that is usually in vegan cake recipes.) Definitely a keeper recipe which works for nonvegans as well. Looking forward to making this again. PS. I used the cinnamon “butter” cream frosting. Thanks, Jenn! Oh, I’m so glad you loved it, Maggie! Thank you! What kind of gf flour did you use? I know some people were asking on my FB page about making it gluten free, so I’d love to give them an update. And, yes, the pineapple adds moisture and a bit of sweetness. You could sub applesauce, but I find applesauce to make things a bit gummy and heavy. Thank you so much for your comment!